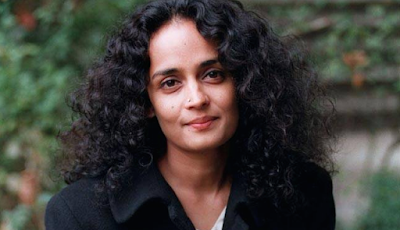 Last time we looked at the way Arundhati Roy accumulates reality from small, odd, vivid details, but once we piece it together “The God of Small Things” is actually a fairly plot-packed story: We get a riot, a molestation, an accidental drowning, and a police murder all happening in a weeklong-period. So let’s talk about how authors get us to commit to a book in the first chapter, especially one where the narrator (1st or 3rd person) has some perspective on events. The traditional way to is to promise that a lot of juicy stuff is going to happen later on if you keep reading. And indeed, this books is well set-up to do that. We begin with an adult Rahel coming back to town in modern-day to reunite with her long-lost brother and deal with how the event that separated them and traumatized their lives. We will then spend most of the book reliving that eventful week. I know how I would have written that first chapter: We meet our mysterious heroine as she gets off the train, we find out just a little bit about her, we see that she’s on a mission. She meets with someone from her past while looking for her silent brother, and obliquely references the riot, the molestation, the drowning, and the murder (Now our appetite is whetted for the shocking events to come). Then she finds her brother and tries to speak but the memories flood over her. Then we cut back to the day of the riot and we quickly get dialogue of 7-year-old Rahel in that time period. Now our two heroines (adult Rahel in 1993 and young Rahel in 1969) are established. From that point, Roy would be free to jump around to other points in time, such as the birth of the twins, the mother’s later death, Rahel’s own failed marriage, etc. But Roy doesn’t do that. She’s all over the place and it’s hard to put your feet down anywhere for the first thirty pages or so. When I read the book, I read those thirty pages, realized I was totally lost, and decided I’d better go back and read them over again if I was going to continue. I did so, was glad I did, and then kept going until I was able to put my feet down around page 40 or so. While this whole process was going on, I was loving the book, because of the sentences, but I was struggling with committing to the plot. Roy does foreshadow the book’s momentous events in these opening chapters, but because I didn’t have a sense of whether they were going to happen in a timeline I was going to stick to, they didn’t whet my appetite very much. What I really wanted was dialogue. Dialogue tells me to put my feet down, but the first dialogue we get is at Sophie’s funeral, which actually comes at the end of the 1969 timeline, not the beginning, so that just discombobulated me further. In those early amorphous years when memory had only just begun, when life was full of Beginnings and no Ends, and Everything was Forever, Esthappen and Rahel thought of themselves together as Me, and separately, individually, as We or Us. As though they were a rare breed of Siamese twins, physically separate, but with joint identities. Now, these years later, Rahel has a memory of waking up one night giggling at Estha’s funny dream. She has other memories too that she has no right to have. She remembers, for instance (though she hadn’t been there), what the Orangedrink Lemondrink Man did to Estha in Abhilash Talkies. She remembers the taste of the tomato sandwiches—Estha’s sandwiches, that Estha ate—on the Madras Mail to Madras. Right there in the opening sentence, we have three time periods mixed up, and the reader will have a hard time getting his or her feet on the ground after that …and yet it’s very easy to fall in love with the book. Such writing has its pleasures. Readers do enjoy being challenged. We can admire how such writing captures the feeling of being lost and overwhelmed by the modern world, and, as we make sense of it, we can gain tools to sift through and make sense of our own jumbled lives. Post-colonial writers have literally had the ground yanked out from underneath their feet by invaders, and now that they have reclaimed their countries, they’re trying to find their footing again. But the ground isn’t letting them. It keeps shifting. When they describe their work in interviews, many of them say that their sense of identity, both personal and national, remains fractured. The style of post-colonial literature captures and grapples with that problem. So the question is, should non-post-colonial writers emulate this style? These are, after all, best-selling and beloved books. But it’s a lot to ask of your reader, especially if it’s not a style that you are personally deeply committed to. Unless you feel that such a style is an essential expression of your theme, you might want to put the reader’s feet on the ground a little more firmly than Roy does, just with a few uses of grounding dialogue. Hi! I've been reading your website for a long time now and finally got the courage to go ahead and give you a shout out from Lubbock Tx! Just wanted to tell you keep up the fantastic job!